I've just live-blogged my way through the Samsung Galaxy S9 launch, and the one thing that struck me was... well, how little struck me. Admittedly, that's a lot to do with the fact that the Galaxy S9 was leaked so often, and so comprehensively, that I failed to see anything new on stage today. But even if this had been entirely new to me, I'd still have struggled to talk about the headline features of the phone straight away. "Well, yes, the screen is... okay, the same. 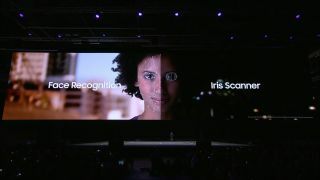 But the camera is new... yes, it's still 12MP and still a single sensor. No, the design is the same. Yes, entirely the same. And yeah, sorry, the Bixby button is still there." We've berated brands like Apple and Sony for not updating their phones in years gone by, and Samsung should get the same treatment: this is the most minor upgrade we've ever seen from the brand, and yet we're seeing the highest costs yet for a Galaxy S-series handset. But here's the thing: where is there left for phone brands to go? Apple made waves with the iPhone X because it had stuck with the same design for so long that any upgrade was going to be innovative; but Samsung made the jump to all-screen last year, and has been leading technical innovation for years in the flagship smartphone space. What does come across with the launch of the Samsung Galaxy S9 is that it's focused on more things you can do with the phone. Yes, we saw super-slow-motion video on the Sony Xperia XZ Premium last year, but Samsung has improved on this with a camera that can intelligently tell when you'll want to capture footage in slo-mo. This is also the most powerful phone Samsung has ever put out, and the enterprise message has been upgraded to enable more businesses to use the S9 with confidence that it's going to be incredibly secure; it's not headline-grabbing stuff, but it's the kind of thing that smoothes the Samsung story out for those thinking of making the switch. What leaves a unpleasant taste in the mouth are the constant jabs at Apple. Yes, it's key to point out how your phone is the best on the market, but the amount of times we heard how Samsung doesn't do that thing Apple does (the notch, the remaining fingerprint scanner) wasn't edifying. Although there is one element we're glad Samsung highlighted: the remaining headphone jack. So many brands are losing the port in order to save space inside the chassis, but this is still something that really irks. Yes, the headphone port is old – really old – but so are lots of things I don't want to see replaced. The wheel. Bread. Open fires. There are better options, but losing them doesn't always make life better, and it's good that Samsung is remaining the standard-bearer here. I'm yet to be convinced by AR Emoji, but even if they don't work you can use this feature as the identifier of what Samsung is trying to do with the Galaxy S9: make a phone that's accessible and which packs more features that delight the user. I don't think it's necessarily done that – the price alone is alienating, just as it is with the iPhone X – but to just say that the phone is boring because of the lack of cosmetic change misses the point. That new camera needs to absolutely shine though – if it doesn't, it's going to be a tough sell for anyone to buy the Galaxy S9 at its higher price when so many of its features are also found on the still-powerful and much cheaper Galaxy S8. We'll be bringing you our full review of the phone soon, so let's see what shakes out as we spend more time with the Galaxy S9 – we can all reserve judgement until then.